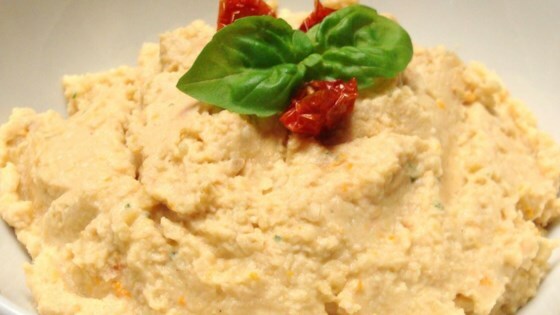 "Hummus is a creamy puree of garbanzo beans and tahini (sesame seed paste) seasoned with lemon juice and garlic. It is a popular spread and dip in Greece and throughout the Middle East." Place garlic, salt, tahini, and lemon juice into a food processor; process until smooth. Pour in the garbanzo beans and 1/2 cup olive oil; process until smooth again, scraping the sides of the bowl occasionally. Once smooth, add the sun-dried tomatoes, and pulse until they have been chopped to very small pieces and are incorporated into the hummus. Finally, add the basil, and pulse a few times until mixed in. Spread the hummus into a shallow serving dish, and make a few decorative grooves on top. Refrigerate at least 1 hour, then drizzle with 2 tablespoons olive oil and sprinkle with paprika before serving. Grilled chicken is tossed with spinach, feta, and tomatoes and served on toasts. I had a problem getting it to be really smooth (Might just be a problem with my food processor?) But the flavor is really good and it's a healthy and cheap snack to have on hand. Awesome! I halfed the recipe (used 1 clove of garlic) and omitted the tahini - AMAZING! This is the best hummus I've ever had. This hummus is the best that I have ever had! One time I made this recipe and substituted the sun dryed tomatoe for 1 whole jalipeno. Again, the hummus was fantastic! What can I say? this is just a great recipe! I make it all the time now- I just need a better processor! Thanks so much! Awesome recipe! I make this weekly. I also add chopped artichoke hearts!